Dendê Macedo | Feel the Music! 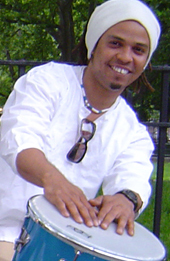 A former member of Timbalada, Dendê has been performing professionally since the age of 14. With Timbalada he toured all over Brazil, Europe and Asia, appeared on various television shows including Xuxa, Faustão and Ileana and has performed and recorded with such artists as Marisa Monte, Gilberto Gil, Carlinhos Brown, Yvette Sangalo and Sepultura. As a member of Timbalada, Dendê recorded many of their albums. Having left Brazil in 2001, Dendê now lives in the US, performing with his groups Hãhãhães, an Afro-Brazilian/Afro-Cuban fusion band, Arrastão, an Afro-Brazilian percussion band and Ologundê, a traditional Afro-Brazilian group as well as many other performing groups. Dendê can be seen performing in New York City with the Afro-Brazilian band Ogans and was a regular member of the jam sessions at Walker Stage. Dendê has performed at the Mercado Cultural in Salvador da Bahia, Brazil with the exceptional jazz improvisation ensemble Speak in Tones which was lead by Daniel Moreno, Mike Ellis and also featured Cheikh Tidiane Seck, Graham Haynes and many others. Since then he also appeared on stage with Giovanni Hidalgo, Zakir Hussain, Adam Rudolph and many other exceptional musicians as part of the World Music Institute benefit concert. He has been featured in performances with the Italian singer/percussionist Alessandra Belloni and has peformed internationally with Vinicius Cantuaria. Dendê also teaches Afro-Brazilian percussion classes in the New York City area and organizes percussion trips to Brazil.